Marissa De Leon leads a music based wellness participate community drum circle at the RGV Music Therapy and Wellness Center on Saturday, Jan 13, 2018, in Mercedes. In May of last year, Marissa De Leon brought the first ever therapy and wellness center to the Rio Grande Valley. De Leon will host a free monthly community drum circle this year with the mission to bring healing to the region, “whether it’s through music or whether it’s meeting new people that are like-minded,” she said. The first session was Jan. 13 at the RGV Music Therapy and Wellness Center in Mercedes, which happens to be De Leon’s hometown. 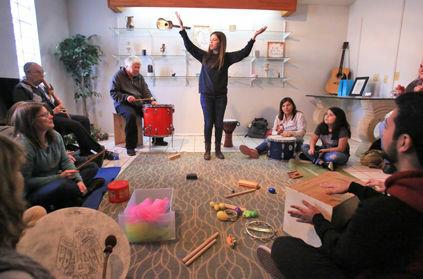 More than a dozen people attended the first music therapy session. De Leon sat at one side of a wall with her father — who is also a musician — seated to her right before a large drum, while attendees sprawled out on a large rug and yoga mats. Musical drums were provided, as well as makeshift creations that included object-filled soda cans and empty coffee containers. To get the rhythm going, De Leon instructed her father to “keep a steady beat:” the other drummers followed suit. Throughout the session, she acted as an orchestrator by adjusting the volume and moving from one section of the room to another with hand motions. De Leon said the majority of her patients are home health adults with special needs. However, music therapy benefits a wide audience. While she plays several instruments, she chose to use drums for these community sessions due to research findings. Her website lists goals and outcomes in music therapy, including: improvement of motor functioning, enhancing memory, increasing attention to a task, facilitating emotional release, spiritual expression, etc. Anna Almazan from McAllen attended the first session in order to ease some tension from her “very stressful” job. “Having to think of something else and getting into the rhythm,” she said, helps her to feel “in tune” with her body. By the end of the year, De Leon hopes to make music therapy more accessible to the community by adding additional music therapists and sessions. For more information on treatments provided by the wellness center, visit rgvmusictherapy.com or find it on Facebook, Instagram or Twitter by the same handle. The story has been updated to reflect the correct name for Marissa De Leon.